Just because you read it on the internet doesn’t mean it’s true. That’s the lesson The Legal Genealogist was reminded of, again, this week when it turns out that something that’s repeated in many places on the internet simply isn’t true. Um … No, they’re not. It turns out that all the bankruptcy case files from all around the nation have been moved to one central location. They’re now at NARA Kansas City. This surfaced after Tuesday night’s webinar, “NARA Nuggets: Genealogy in the Archives,” for the Association of Professional Genealogists where, based on what I had just reviewed on the NARA website in the days before the webinar, I confidently told a fellow APG member that he could get a bankruptcy case file for an ancestor who’d filed in South Carolina at the National Archives in Atlanta. Archivist Jennifer Audsley-Moore at NARA’s Kansas City regional archives confirms that the bankruptcy case files held by NARA are now centralized there in Kansas City. The effort to move them began in 2015, and was completed sometime last year. So requests for a copy of a bankruptcy case file are now being processed in Kansas City. That’s the easy part. What’s a little more complicated is making sure the NARA catalog reflects the change. So far, about two-thirds to three-fourths of the catalog entries have been updated, but that leaves a very large number remaining to be done. So… what’s a genealogist to do? First, try to confirm exactly when and where the bankruptcy case you’re interested in was filed. Audsley-Moore notes that not all 19th century bankruptcy cases would have gone to federal court because the laws of that century tended to be temporary. “If someone is searching for a bankruptcy case file between the major acts (1800, 1841, 1867, 1898) it is possible it was filed in a state or county court,” she says. But checking the newspapers of the day is a great way to determine that, yes, Great Grandpa really did file for bankruptcy in the federal court in South Carolina. Second, if you don’t have the case number, contact the NARA regional repository that holds the federal court records for that particular place and time. Remember that not all post-1940 bankruptcy case files are being retained for archival purposes; only a small percentage of the files are being kept, and only the regional repositories have the information now about which ones exist and which ones don’t. (Audsley-Moore hopes that will change, and notes they’re “working on a bankruptcy specific website that will have all of this information in one place.”) The regional branch can do a docket search to verify that there actually is a case file and provide the case number. Third, with the case number, contact NARA in Kansas City ([email protected]) and ask for a check of the case file. You’ll get a report back by email telling you if the file can be found, how many pages it has and what it’ll cost to order it. 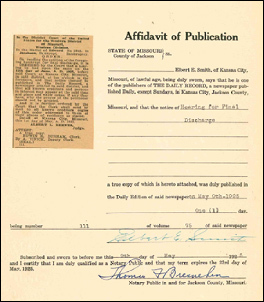 Image: Affidavit of publication, In the Matter of Edward Jacobson, Bankruptcy Act of 1898 Case Files, 1898 – 1950, Records of District Courts of the United States, 1685 – 2009; National Archives, Kansas City; digital images, Archives.gov (https://www.archives.gov/ : accessed 25 Aug 2017). I am now having sitting here going through the 31 pages of the bankruptcy case of Wilford F. Peterson and learning a lot!Jennifer and her colleagues were quick and efficient, we like that! Outstanding, and thanks again for the heads-up! Yes, I got some bankruptcy records from Kansas City earlier in the year for my great-great grandfather after learning they had been moved. Not as many pages as Kelvin’s, but still interesting! He had $330 in debt and his only property was $50 in household furniture that was exempt from being repossessed due to…a Vermont state statute. 🙂 Now to go find that law! >> Now to go find that law! I’ve been converted! 🙂 I even preach about the conversion. I ordered bankruptcy files recently from the Kansas City Archives, but I really don’t know what to expect. Could there possibly be any family members relationships contained therein? It’s all an “it depends” situation. If the bankrupt was trying to discharge debts to a family member, the file could be rich in family information (since proving it was a real debt and not a gift would be an issue). If no family was involved, then it’d be more the personal story of the bankrupt and his/her situation.